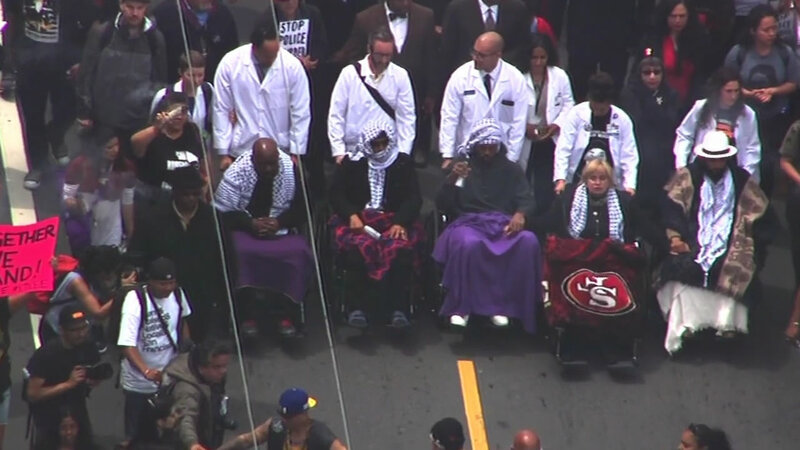 SAN FRANCISCO (KGO) -- Five people dubbed the #Frisco5, have been hospitalized following their hunger strike to protest fatal shootings by SFPD and calling for the ouster of the city's police chief, Greg Suhr. They have been hospitalized due to their deteriorating health. Hundreds of protesters came to San Francisco City Hall on Tuesday afternoon in support of hunger strikers calling for the ouster of the city's police chief and interrupted a Board of Supervisors meeting to shout their demands. 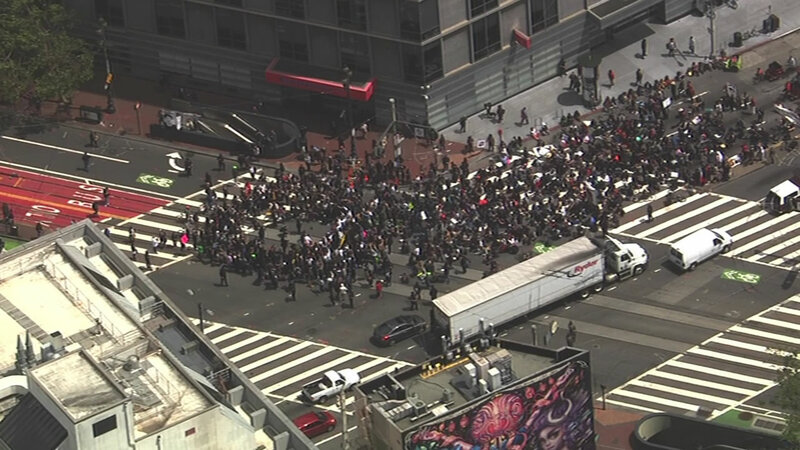 Protesters calling for the firing for San Francisco Police Chief Greg Suhr over the alleged use of excessive force in recent police shootings are marching in San Francisco streets. Demonstrators marched from the Mission District Police Department and are headed to San Francisco City Hall. "This mayor's a complete disgrace and if anyone doesn't see that then they don't know what's going on," said Sallssie Striker, one of the hunger strikers, on Tuesday. "This is the most despicable mayor and we are putting our line on the line and tehy going going out." The protesters then entered City Hall and stood outside the door to the mayor's office, where they were told by a staffer that Lee was not inside. "Now is the time to take action," one protester said at the meeting. "People are dying literally across the hall, they're withering away. Are you ready to do something?" "I'm tired, I'm tired, my body hurts, my muscles are sore. This crowd, the people, they lift you up but you crash every day and I don't know how long I'm going to last," said Edwin Lindo, a hunger striker. Jose Hernandez, a Daly City resident also at the protest, questioned why police didn't use crisis negotiators in cases like Woods' before opening fire and said the shootings are an example of injustice in the city. "San Francisco is the most beautiful city aesthetically, but not in a social or economic way," Hernandez said. Protesters continued on to a scheduled forum hosted by San Francisco Police Chief Greg Suhr and the City's public defender Jeff Adachi. It was then announced the event was canceled, but later Adachi welcomed protesters to join in in a conversation on police accountability at Congregation Sherith Israel in Pacific Heights. Suhr would not be attending the event.